The Tong Peal Uni-Fill is desgined to fill big bags or boxes speedily and without damage to the crop. 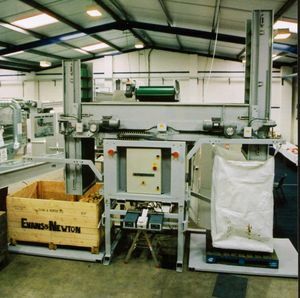 A reversible conveyor feeds the crop to vertical elevators which are lowered into the bag or box. As the crop flows the elevator rises via sensors until they are full. When one elevator has filled the bag or box the crop conveyor is automatically reversed and the elevator on the other side begins. The cycle continues for as long as filled bag or boxes are replaced with empty ones. There are two automatic programmes. One for big bags and one for boxes.